Is this the new normal? Let’s hope not. The government claims that Library and Archives Canada needs to be modernized so all Canadians can access archival services. Yet the state of Canada’s online collections are small and sorely lacking when compared to their expansive on-site collections. LAC does need to modernize, and the goal of expanding access beyond just Ottawa is actually a laudable one. But what they’re doing here, under the guise of ‘modernization’, is simply cutting services and diminishing our access to Canada’s past. In this post, I want to show you how small and insignificant LAC’s online collections are, why they haven’t taken them seriously, and that if we’re fighting for better on-site access, we might as well fight for better online access too! They are, after all, despite the rhetoric of LAC and the government, not incompatible in the slightest. LAC’s service statistics provide a vivid illustration of this digital revolution. Our website now gets close to half a million visits per month. In contrast, LAC’s in-person service hub located at 395 Wellington Street, receives about 2,000 visits per month. These two service points are also trending in opposite directions, with online consultations increasing rapidly, and in-person visits declining slowly but steadily. Despite rhetoric of modernization and looking forward to the digital era, LAC has been comparatively slow in aggressively preparing for the next generation. It has been pointed out by several people that it will be even slower now that 50% of its digitization staff will be cut! We need to contextualize LAC’s digital collections. Let’s quickly see what the Library of Congress (LOC) in the United States has been up to on this front. Their print collection is already dwarfed by their newest collection of archived born-digital sources. If each and every one of their 26 million books was scanned and digitized at 8MB per book, the collection would be about 200TB (a figure that you can now conceivably store at home). Just from websites alone, the LOC now has 254TB of data, adding 5TB a month. They’re taking the internet seriously. 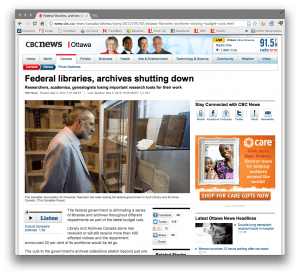 Library and Archives Canada, on the other hand, only collects a “representative sample of Canadian websites,” notably the government, and has about 7TB of data. While some recent pronouncements suggest that LAC is taking born-digital sources seriously are encouraging and should be celebrated, it is a pin compared to a much larger haystack of archival information. Firstly, there simply isn’t that much there that has been digitized. LAC has an incredible on-site collection for Canadian historians: be it political history, social history, cultural history, military history, etc. If we go to their “about the collection” page, we see that they have: 71,000 films, 2.5 million architectural drawings, millions of books, 21.3 photographs, not to mention the thousands upon thousands of boxes. In that list I provide, they also note that as of 2007 they had “3.18 million megabytes of information in electronic formats.” Sounds, impressive eh? That’s only a bit over 3TB of data. Presumably that doesn’t include their web archive, which dwarfs that, but it starts to give you a sense of the mismatch in size between conventional and digitized historical sources. They also don’t take many steps to make their online collections (what they have there) fully accessible to researchers. Canadiana.ca provides an Application Programming Interface (a way for a computer program to talk directly to another computer, and speed up research – and let you do new, cool things with the data). Library and Archives Canada does not. If LAC was really serious about modernization, if they put more of their collection online in a comprehensive manner, if they were open to new forms of research, and if they didn’t do this at the expense of their on-site collections, this would be a good thing. But, given the state of their online collections, I don’t see any reason to be happy here. So, as we begin our fight to Save Library and Archives Canada, taking action by sending letters to the Minister of Canadian Heritage as well as the Librarian and Archivist of Canada, why don’t we also call out for better online services. There’s a kernel of truth to some government pronouncements: all Canadians, not just those who can come in person to Ottawa, deserve access to their national archive. But instead of using that chip as a talking point to justify cuts, let’s actually mean it. All Canadians deserve robust archives, be it on-site or online. Ian Milligan is co-editor of ActiveHistory.ca and is also a postdoctoral fellow with Western University’s Department of History.